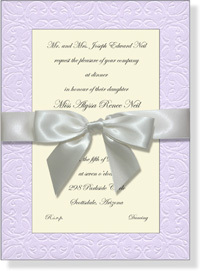 Exquisitely embossed antique pattern decorates this soft lavender invitation. Imprintable ecru top card mounts with adhesive foam tape and set is accented with a PRE-TIED ivory satin bow! Beautiful choice for any bridal event or party. Customer assembly required. NOTE: only 1 box left! SIZE DIMENSIONS: 5.75" x 8"